This country is beautiful, and surprises me every day. Just 45 minutes drive south is Dedza, the next market town along the road to Blantyre. If you turn off the main road and drive on the gravel road a few miles towards the Mozambique border, through villages and around a few hills, you come across an old church where the road ends. Beyond this, its only a 30 minute hike up a totally random hill, with a local guide from the village who will spot you and be over to show you the way before you park. Through a couple of maize fields, up and then to a rocky outcrop. This is a newly designated UNICEF World Heritage Site, the second in Malawi. 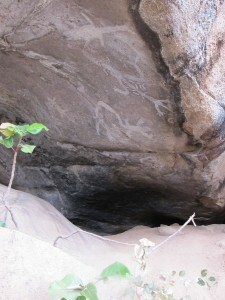 Stunning rock paintings some a few hundred years old. Others a thousand years old. In the middle of a hill, with no-one around. Just stunning. 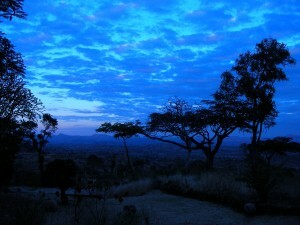 Of course there is also Liwonde National Park, Mount Mulange, Nyika plateau. And of course Lake Malawi. 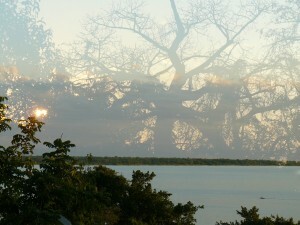 The third largest lake in Africa often seems like the sea. I love heading down when we can for a weekend relaxing by the beach, and enjoying the serenity. A number of patients come to Nkhoma blind. That is they can perhaps see a finger or two at 3 metres from them. Sometimes even less, only able to see a hand waving in front of them, or even just able to see light and dark but no detail at all. A number of these patients are blind in one eye because of something that we can do nothing about. A large scar on their cornea, very high pressure in the eye and end-stage glaucoma, trauma, previous infection or severe problems at the retina at the back of the eye. It often happens that then the other eye (which in effect is their only ‘good’ eye) is severely visually impaired because of cataract. It falls on me to have a chat with them about surgery, and then go ahead and do the operation if they agree and consent. In the operating theatre, you take a deep breath, relax and go ahead and perform the cataract surgery calmly as you would any eye (trying not to think that this is their ‘only eye’, and that you kind of have only one shot). Mr Jamison is 83 years, and came to Nkhoma from Mchinji, near the Zambian border, with one of our mobile clinics. 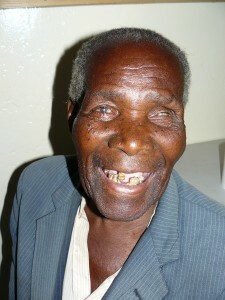 He has been blind in his left eye for 50 years from trauma, since a thorn went into the eye. He can’t even see light from his left eye. He had over the past 11 years been finding it increasingly difficult to see with his right eye. In fact he said he has been blind for around 5 years. He couldn’t see his maize or other food, and some children sometimes would come and take his meat. I operated his right cataract and thankfully it was a great success, and he was thrilled. He said he is going to celebrate by buying many fish! I have operated cataracts on over 60 patients with ‘only one eye’ so far this year, and it fills me with joy and considerable relief to see them happy the next day! Towards the end of November the rains start to arrive. There is a flurry of activity over the country as people prepare the fields for sowing. Many have already started. Nature has amazing ways of announcing the last few weeks before the rains. Of course it is hot, but there are plenty more larger spiders, small scorpions (found one in the kitchen sink yesterday morning), snakes (nearly walked on one in the garden three nights ago), and ants. The flame or flamboyant trees are now in full bloom across the landscape. All this means the rains are close. And they can’t come too soon as it would be great to escape this heat! Well, to be honest, the rains can come too soon, and many villagers have to take chances on exactly when to sow the maize seedlings. If they sow even just a few weeks too soon, and the rains stop for a couple of weeks; they can lose everything. It’s an incredibly important time of year. With government subsidies of fertiliser, good rains and lots of hard work the harvests have been good in the this area over the past years. We hope and pray it will be the same this year. Jenn and I are off now for a Saturday drive south to the Dedza hills, to try find the hidden Chongoni Rock Art Area. 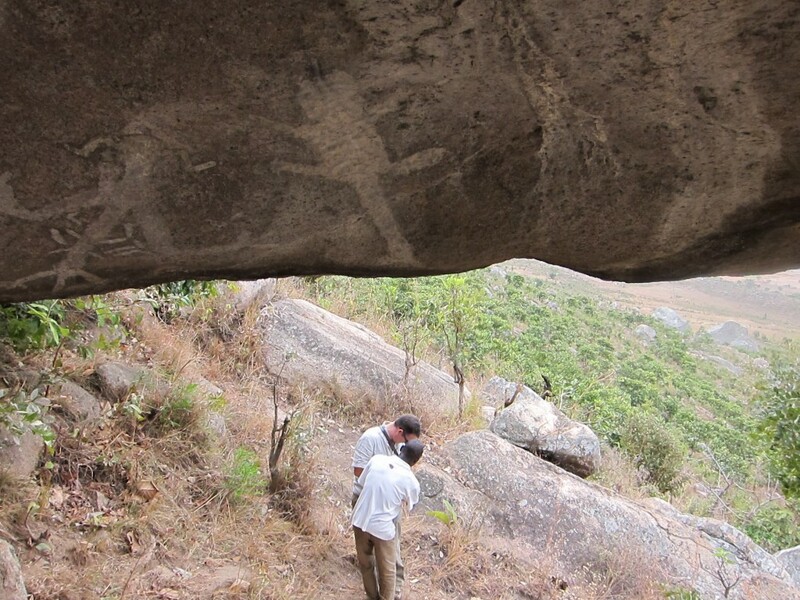 Hope we can find these two thousand year old rock paintings in the caves and hills, and see why there were recently inscribed the area as Malawi’s second UNESCO World Heritage Site. Two friends of mine were in a road traffic accident on Saturday morning. The truck they were riding in was towing a minibus, which blew a tire and veered out of control, pulling the truck with them in it off the road, off a bridge and down a 4 metre drop into the river below. Thank God it was a river. And also thank God that they were all helped out of the water with just scratches and bruises. It could have been a lot worse. A lot. One was a teacher, the other was a doctor, both working at Nkhoma. My good friend and colleague had cerebral malaria and a stroke nearly a year ago, and is still recovering. Two other work colleagues have had near death experiences on the roads in the past year. We have lost one member of staff to AIDS, very sadly just after I arrived. About once a month a member of staff at the Eye Hospital goes off sick with Malaria, and thank the Lord recovers after treatment. About once a week a member of staff is off for a day to attend a funeral in their village. I very luckily have only had malaria once, and took the treatment very quickly, and was back at work after 3 days. It was like a bad cold and fever with strange joint pains. But the treatment worked quickly, and unlike a cold it was cured within days, not to linger untreatable for a week or more. This is the life and reality here. We are not immune to malaria, accidents and other events and conditions that affect the population we serve. It is times like these that I try to calmly sit and reflect on our blessings. The blessings of health, and the great work we are involved in. There is a tradition in Africa whereby if a person has had a great tragedy, such as a death in the family or a near-death personal experience; that the whole village will line up outside the house, in a manner, and enter the house in turn. The one who is traumatized, so to speak, is then given the opportunity to recount the events and ordeal to each visitor. Sounds heavy retelling the tale a hundred times, but the community support and comfort lends itself to healing. This is Africa. Dangerous. Beautiful, and full of love and true community support. Unpredictable. And we are only here at Nkhoma Eye Hospital to help those in need of help for their disabilitating blindness. But, we all live here. With or without electricity. With or without running water. With mosquitoes. With dangerous roads, dodging pedestrians, cyclists, goats, chickens, other vehicles and unreal accidents. When I say running water I am pretty good at my house really. The taps in the house run almost 6 out of 7 days a week. We are in dry season though, so the water in the big lakes at the top of the mission village drain quickly. You can’t drink the water anyhow. It’s unfiltered from the river, and there is the chance of water-borne diseases. For drinking water I have a 5000 litre tank on the side of my house that collects rainwater. I treat this water chemically, filter it through an Indian ceramic filter, then a Britta filter. Or boil it, and use it for cooking. The last rains were 6 months ago though, so it is nearly empty, and yellow algae tend to grow after a while. So lots of boiling. We need to give thanks that through all this, there is no war here. There is no violent tribalism. There is nothing to really fight over, no big gold or diamond deposits. There is no political unrest or massive inflation. There are no great floods or droughts or plagues. There is no scourge of violent crime. 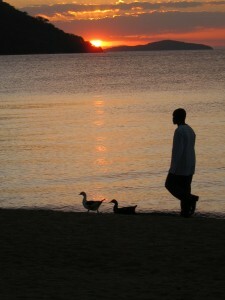 We are actually very lucky in peaceful and beautiful Malawi. We can still plan and carry out our work, trying to travel and find blind and vision impaired in villages in Central Malawi, without daily fear or trepidation. But, we are reminded sometimes that it is a relatively dangerous world we live and work in. I have so much respect and love for all here who partake in this; and we all have so much heartfelt thanks for all who support it. There are no photos for this update, none needed I feel. In Nkhoma, I am planning carefully for the next two months as we run up to the end of the year. We will stop working for Christmas, but will be aiming to help as many people as we can for the next two months, and hope to work flat out. I had a busy day on Tuesday getting all the initial surgical supplies together for the modern phaco cataract surgery machine. I and the staff are very excited about the prospect of introducing this to Nkhoma! Imagine… the country’s first ever permanent modern phaco cataract surgery unit. On Wednesday I met a wonderful group of CBM supporters from Canada, and we showed them the work here. On Thursday I saw a boy who had been hit in the eye with a stick some two months ago, accidentally while playing with friends. The stick had gone into the eye initially, and it took him 6 days to get to the hospital. I cleaned it up and stitched the eye back together. By now, two months later, his eye had healed well, but he couldn’t see anything as his iris, the coloured part of the eye, was stuck. So I took him back to theatre to make a new pupil for his eye. I hope he will be able to see even just a bit now. I went to Lilongwe for a clinic on Friday morning. Nearly hit a baby goat 20 seconds after starting on the road, and a huge 10 metre wide tree branch came metres away from falling on me and 4 patients in the hospital in a freak wind. I then got a call around lunchtime that I may have to go all the way up north to Nkhata Bay on Monday for a cataract session. There are 100 patients waiting to be operated on Monday and Tuesday, and they didn’t want to cancel. In the end one of the other 7 eye docs in Malawi, who is a bit closer than here, was happy to go and cover. Otherwise I would have been starting a 7 hour drive around now. Finished the week with a long power cut on Friday night, so some candles and an early night as totally exhausted. So anyway, the next two months. We really want to end the year on a high note, it’s been a tough year. And the best thing we can do is to go to as many villages, screen as many people, and try and reach as many as we can to offer cataract surgery or other assistance. We have a finite amount of money left till the end of the year, and pretty much will spend it all on diesel for the clinic ambulances and food for the patients. All the medicines and lenses and staff are already here! And this is what it comes down to for the bulk of the work. I hope that link above ‘5 Speed ECCE’ works. It’s a normal cataract operation, at 5 times speed; which is why it is just under a minute long. With the help of the staff here at Nkhoma and in the field, and the great team at Malawi Council for the Handicapped (MACOHA), Mr Kambewa and I are going to try our best to perform as many of these surgeries as we possibly can in the next two months. Except at normal, rather than 5 times speed. It’s the Nkhoma team’s real strength… high volume high quality surgery. And it’s our hope that as many individuals as possible, who are now struggling with the burden of blindness, will be able to see by Christmas.